"And Mario Götze has won it for Germany!" – The words uttered on 13 July 2014 that meant a fourth FIFA World Cup title for Germany and a place in history for Götze. Still only 26, the twinkle-toed attacking midfielder has already played for Borussia Dortmund and Bayern Munich, yet the road to glory has never been straightforward. bundesliga.com presents 10 things you may not have known about the German playmaker who has suffered plenty of highs and lows. The middle of three brothers, Mario may be the most famous of the Götze fraternity, but they have all forged careers in football. Both Fabian and Felix are defenders – no doubt a result of young Mario needing people to practise against – and products of the Dortmund youth academy. Older brother Fabian spent most of his career in the reserves at Dortmund, Mainz and Bochum before retiring after a spell with Unterhaching. The younger Felix joined Bayern as a 16-year-old, featuring frequently for the reserves and also appearing on the bench in a number of first-team matches. He then joined Augsburg on a four-year deal in summer 2018. Born in the Bavarian city of Memmingen, around 70 miles west of Munich, Mario and his family have moved around often. At the age of three, the Götze clan headed to Texas after Mario's father, Jürgen, an academic, received a research grant from the University of Houston. The family returned to Memmingen after 18 months before a move north to Dortmund, where Jürgen was appointed a professor at the Technical University. That was where, as a six-year-old, Mario joined the youth teams at Eintracht Hombruch before being picked up by BVB at the age of nine. While it isn't necessarily rare to see brothers playing alongside each other professionally, it is at youth level when the brothers are two years apart. But that is exactly what happened in Dortmund, where Mario almost exclusively played in a higher age group. At just 16 he was the youngest player to feature in the finals of the 2008/09 U19 DFB Cup and Bundesliga, with his older brother as captain. Mario provided 11 goals and seven assists in just 18 matches that campaign, including scoring in the league final defeat to a Mainz side coached by Thomas Tuchel and led by Andre Schürrle – the man who would five years later set him up in the final of the World Cup. In 2013, Götze made global headlines for the first time in his career. For three years he had been a key member of Jürgen Klopp's barnstorming Dortmund side that won back-to-back Bundesliga titles and reached the final of the UEFA Champions League. Just weeks before that final, however, the Borussia world came crashing down as it was announced Götze would be joining their arch-rivals Bayern. He became just the third player in history to make the move and faced heavy criticism from the BVB faithful. However, his time at Bayern failed to live up to the hype. Götze never saw eye to eye with Pep Guardiola, and struggled to recreate the form he had shown at Dortmund; by the time Carlo Ancelotti took over, Götze was deemed surplus to requirements and made a sensational return to Borussia. Such hype is a lot to take for a young player, but Götze justified the praise in the 113th minute of the 2014 World Cup final in Rio de Janeiro. Taking down a ball into the box by former youth rival Schürrle, he volleyed past Argentina goalkeeper Sergio Romero to etch his name forever into Germany's history books by securing the country's fourth World Cup title, the first as a unified nation. After that goal, Germany boss Joachim Löw revealed that he had given Götze special instructions in extra-time: "Go and show the world you're better than Messi and can decide the World Cup." And that's just what he did. As Messi and Argentina faded late in the game, the youngster Löw described as "a miracle boy, a boy wonder, a player always able to decide a match" shone on football’s grandest stage. Götze's move to Bayern almost broke the then-Dortmund coach, Klopp. Just days after BVB had dramatically beaten Malaga to reach the Champions League semi-final, Klopp was called into the office of BVB sporting director Michael Zorc. As Klopp explained in a documentary on Götze, "He told me Mario was leaving for Bayern. I just turned around, went home and lay on my bed. 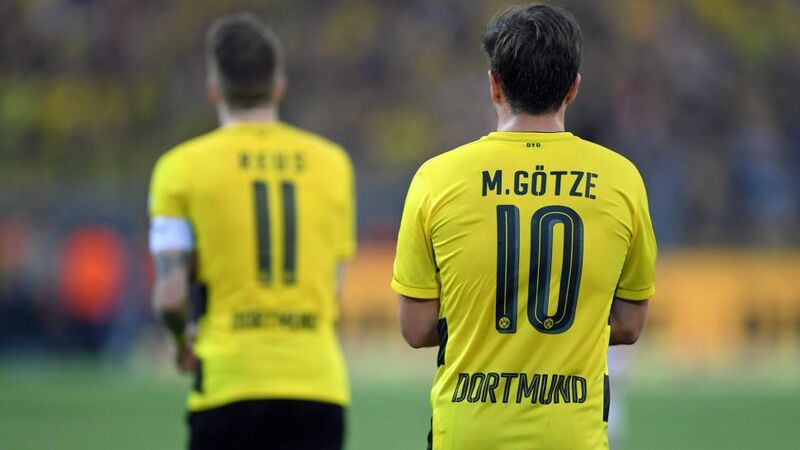 Watch: Check out Götze's top three goals for Dortmund to see why Klopp is right! "We were meant to be going out that night, my wife was all ready and I told her there was no chance that night. I just lay in bed." Klopp had been the coach to introduce Götze to the world. He knew him better than anyone in football, but could not believe he'd lost his prized asset. Few people have rendered the Liverpool manager speechless, but Klopp harbours no ill feelings, and even believes Götze is still as good as he was in his first spell at Borussia. "Mario is in no way a worse footballer now than when he was younger," he said recently. A sport fiend in general, Götze is a huge fan of tennis and can often be found at tournaments when time allows. He particularly admires the sport’s legend Rafael Nadal, and the pair even share a birthday - 3 June - although the Spaniard is six years Götze's senior.